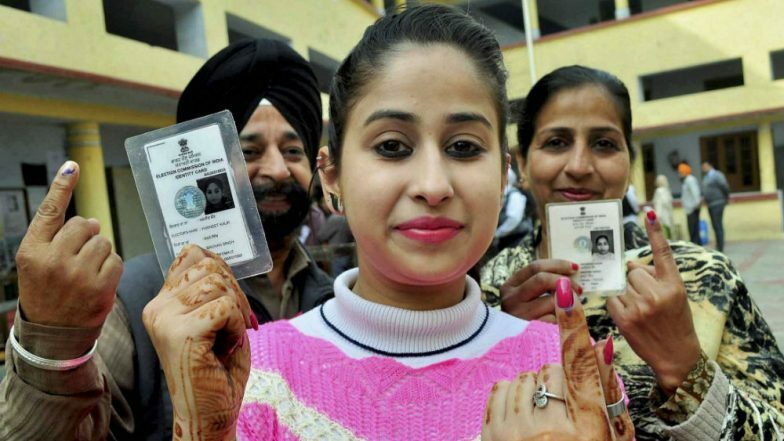 New Delhi, April 11: After a gap of five long years, Indian citizens exercised their democratic rights in the first phase of Lok Sabha Elections 2019 on Thursday. Along with the Lok Sabha polls in 91 constituencies in 18 states and 2 Union territories, Assembly elections also took place in the states of Andhra Pradesh, Arunachal Pradesh, Sikkim and Odisha. Barring some minor EVM glitches, poll boycott and violence, the elections in these states were almost peaceful. In Andhra Pradesh, polling began for 175 Assembly seats at around 7 am on Thursday and voters were seen lining up in the queue to exercise their rights in their polling booth. The final voting percentage recorded at the end of the polling was 66 per cent. With renowned personalities for South Indian film industry – Allu Arjun, Mohanbabu, Vishnu Manchu, Pawan Kalyan, Naga Chaitanya, Samantha Ruth Prabhu, Chiranjeevi, Ram Charan and others – were seen showing their inked fingers, enthusiasm gained momentum among the voters in several places of the state. Assembly Elections 2019 Phase 1 Live News Updates: Phase 1 Polling Concludes in Sikkim, 69% Polling Registered. However, there were several cases of violence that interrupted the polling in many polling booths and cases of violence too was heard. In one incident, a clash broke out between YSRCP and TDP workers in Puthalapattu Constituency in Bandarlapalli. Also, Telugu Desam Party (TDP) worker Bhaskar Reddy and YSR Congress Party worker Pulla Reddy died in clashes between party cadre at the polling station in Veerapuram village in Tadipatri Assembly constituency in Anantpur district. In other cases of violence in the state, YSR Congress Party MPTC from Saniverapupeta Village, Matta Raju, was allegedly attacked by Telugu Desam Party (TDP) workers. Also, Andhra Pradesh chief electoral officer on Thursday confirmed that 362 Electronic Voting Machine (EVM) was facing some glitches. Even reports of the polling personnel reportedly deleting 125 votes that were polled in EVM after they learned that they didn't clear the votes cast during the mock poll drive in Andhra Pradesh's Machilipatnam Assembly was heard. In the case of Odisha, where 66 per cent polling was registered for 28 Assembly seats, the voting was comparatively peaceful. However, the sad news arrived from Temurupali under Mathili block of Malkangiri district, where voters didn’t exercise their democratic rights due to the fear of naxals in the region. By the end of the day, the zero voter turnout in booth no - 6 and 8 in Temurupali was registered and the polling officers returned to their base camp without success. Though adequate security arrangement was made to ensure the polling a successful one, zero polling was reported in 15 booths in Chitrakonda block due to fear of Naxals. Even no voting in six booths of Odisha's Chitrakonda was registered due to the threat by Maoists. But the case of Sikkim and Arunachal Pradesh was different in comparison to Andhra Pradesh and Odisha. In Sikkim Assembly – which went to polls for 32 seats – and Arunachal Pradesh Assembly – which went to polls for 60 seats – voters were seen excited to participate in the festival of democracy. The polling per cent in Sikkim and Arunachal Pradesh were recorded as 69 and 57 per cent respectively. The polling was not only peaceful, but in Arunachal, three persons were seriously injured in a clash between supporters of the two rival political parties under Tate Assembly constituency in Kurung Kamey district during polls. Lok Sabha Elections 2019: Phase 1 Polling in 91 Seats Ends Amid EVM Glitches, Violence, Ink Row & Missing Names. As the first phase of Lok Sabha and Assembly are over and the country is gearing up for the second phase, only Odisha’s 119 Assembly seats are left. These seats would go to polls in the next three phases of polls. It would be interesting to see how the next set of voting would take and how the Election Commission rectifies the challenges faced in the VVPAT and EVM machines.